Yesterday, I enjoyed a personal day with my family and a few friends. We checked out of life, drove to the beach, and stared at the ocean for hours, while our children dug the proverbial hole to China. The conversation among the adults was awesome, as relationships were being strengthened as our families continued to learn about one another. evidence of their spiritual thirst. I know that God’s sovereignty will provide the opportunity. That is the most important thing in life. No, that’s not the most important thing, would you like me to tell you what is? I’ve had a lot of training in sharing the gospel, and teach a lot of different methods as well. Many methods teach to look for the conversational opportunity and steer the conversation to Christ. But in this moment, I chose to remain silent and let it go. The conversational context would have been entirely inappropriate for this radical departure from the topic at hand. I would have forced the person into my conversation, rather than continue on the theme we were addressing. This is the obnoxious transition in evangelism. It would have been an obnoxious left turn in a otherwise profound conversation on parenting. In my early zeal, I used to seize any opportunity like this opening in the conversation. The end result was people got defensive and closed that door. My forced transitions were obnoxious. A key part of my evangelism teaching on conversation skills is watching for the activity of the Holy Spirit. When the Holy Spirit opens the doors, transitions to spiritual things are appropriate. When the Holy Spirit is at work in the conversational moment, a conversational transition is easy to make. Conversational transitions at this point are not obnoxious. This conversational moment at the beach was not one of those moments. I didn’t sense any activity of God in this general life conversation. 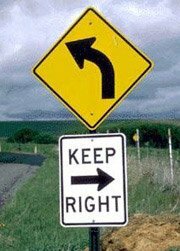 Had I forced the conversation with my obnoxious left turn, I would have stepped into my agenda rather than God’s agenda. Read more about the Effective Evangelism Conversations in the store. It is a recording of a live seminar I gave in 2012 and is available on 3 DVDs. Dear Pastor, I like ur Dscusion very much, I am blessed to know u with such a very Dufferant Topic. Dear brother Iam Pastor Muabrik Khurak Vicotr of Calvary Gospel Ministreis in Pakistan. Why I Agree with you because I leanred about Personal Evalgalism in Youth With A Mission in Holland. I am Trained obver there for Evangalism. With same Habits I shared the Message with Punks, Prostitutes in Amsterdam and in European Countries long ago. Dear brother now in Paksitnan God is using me with the Conersation , by the Personal Freindship Evgalsim. It is very Effective. By Listening them accoding to their Habits we Make the Conersation Better with each other to Draw them to Christ. We must Respect Their Habits weather we like it or not.